A Parents Guide To Helping Out Without Freaking Out! There are many things about being a parent that come natural to us. The basics of taking care of our little ones are an instinctive part of being a parent. We make sure they have a good place to live, nutritious (usually) food to eat, warm clothes, and a good education. These basic parenting tasks happen without much thinking. The hardest part of parenting, for most of us, is learning how to be a good leader for our kids. “Leader” is not a word we often use when it comes to parenting. The word we usually use is “Helper.” We help our kids a lot. We help them get dressed, help them with their homework, help them with sports and maybe a musical instrument, and a many other things that they need. Many kids though, do not want our help. I am pretty certain that my daughter’s first full sentence as a toddler was, “I can do it myself.” Ever since, her desire for independence and doing things herself is a large part of her personality. If they don’t need our help, does that mean we are done as parents? Absolutely not. Although they don’t need our help, they do need something even more important: Our leadership. There is a big difference between helping and leading. Imagine yourself standing next to your child. When we are helping, it is as if we are behind them, pushing them. When we are leading, we are in front of them, showing them the way. It is a small difference in our eyes but for our kids, the difference is large. The problem is that helping is easy and leading is hard. For example, imagine trying to get out of the house with your preschooler who wants to tie his own shoes before leaving. As you mutter to yourself that you should have bought the Velcro laces, he tries again and again to get it done. It would be so much easier to take the few seconds to lace them up yourself and get in the car. Let’s look at more complicated issues, especially with older kids. Even though my son was in first grade over eight years ago, I still remember Ms. Neely’s Whale Project. Each student was assigned a specific whale species and was told to produce a drawing or a model of the whale, plus a speech describing the whale. When this was assigned I was determined to let Max do all the work. My determination lasted about a day. “I’ll just help him a little bit.” The “little bit” turned into me doing almost all of the work on the model. As I was carving it out of foam, Max kept wandering off bored. Why? Because it wasn’t his project any more. I turned it into my project. Instead of providing leadership by instructing him how to sand and paint the model, I took over and sent the message that he couldn’t do it himself. I would have been a much better leader if I didn’t do so much of the work for him. As I sat in the audience with the other parents listening to the whale presentations, I felt a sense of guilt instead of pride, especially when Ms. Neely looked over at me when Max was presenting. Although it might have been just a look of acknowledgement for me being there, all I saw in her eyes was that she knew I did too much of the work! Sometime leading our kids means knowing when to back off a bit. Should I have let Max do the project on his own? No. There were sharp tools involved. But I shouldn’t have taken over and sent the message that he couldn’t do it. Next time you feel like helping your kids ask yourself if they truly need your help and whether it would be better to be a leader instead of a helper. Are you interested in reading about a certain parenting topic, or do you have a parenting question? Contact Neil at: neil@neilmcnerney.com. 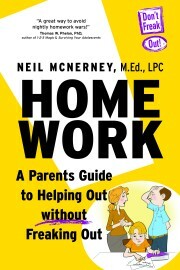 Neil McNerney is a licensed counselor in private practice in Purcellville and author of Homework – A Parent’s Guide To Helping Out Without Freaking Out! Neil provides seminars to parents both locally and nationally on topics of parent leadership.